This new time management game will attract many by its look and kind of smell. Jo's Dream: Organic Coffee is one of those games that are so irresistable becuase they are all about a tory or something that ost people like. And how many of us don't like coffee? And how many of us have ever thought of your own coffee shop? As you progress and are able to earl more money you can afford buying different upgrades. This game is about a girl who had this exact dream about a coffee shop, and she decided to take the first step to make it come true. You are invited to take the next steps with her. You are going to enjoy the game more if you love both coffee and time manageent games. 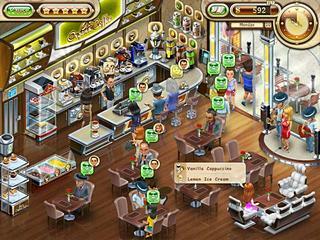 The game's graphics are very warm and comforting like those of many coffee shops. The main character is cute and seems to be a nice young lady. 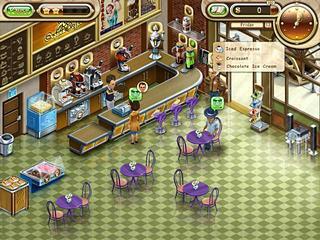 The game play is what you would expect from a good classic diner-themed time management game - lots of clicking, lots of running around. Pleasing your customers is one of the most important things to do here. You need to focus on different ways to keep them happy. Those include hiring a musician or serving them exactly what they ordered, which means you need to know many of the recipes. As you progress and are able to earl more money you can afford buying different upgrades. One of the very helpful ones is a barista. But there are many other cool ones. One of the most important things is to follow the task list to know which upgrade is more useful at the time. The game is really a nice place to spend a few hours playing. Ooh um Yeah. This really dpeends on your taste beacuse not all gaming website or eve magazines are alike. It dpeends on your taste like if you like a lot of feature, go to Gamespot. If you like movies and hot babe with your gaming, then go to IGN. If you like blogs, go to giant bomb or even kotaku. It really is your taste. My favorite ones, However, are Giant Bomb and IGN. This is Jo's Dream: Organic Coffee review. Download this game here.